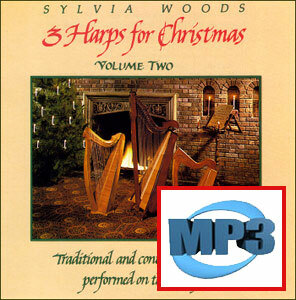 These products are mp3 audio track downloads of music from Three Harps for Christmas Volume2 CD by Sylvia Woods. Recorded by world-renowned harpist Sylvia Woods these lovely Christmas carols are performed on three special harps: a nylon-strung Neo-Celtic harp, a wire-strung ancient Celtic harp, and a Triple-strung harp. Each carol is performed by Sylvia on 1, 2, or 3 harps, with no other accompaniment. Volume 2 contains 25 traditional and modern carols. Some of the favorite traditional carols, and there are also 6 contemporary Christmas songs, and one of Sylvia's original compositions, Winter Bells. Caroling, Caroling / Silver Bells / Let it Snow! Let it Snow! Let it Snow! The Little Drummer Boy / Do You Hear What I Hear?